The RAF station of Much-Binding was first introduced in a show from the Merry-go-round series on the 31st March 1944, and was around until 1954, although by that time, the RAF station was no more, and the former staff now ran a newspaper - The Weekly Bind. The original idea had set up Laughter Command of the RAF, and a ramshackle air station called Much-Binding-in-the-Marsh, where the inmates gave battle to all the frustrations of inconvenience and red tape that war had laid upon them. In peacetime, Much-Binding simply turned itself over to non-combatant operations. The programmes were written by, and starred Kenneth Horne and Richard 'Stinker' Murdoch, although other notable names present were Maurice Denham, Nicholas Parsons, Sam Costa, and Dora Bryan. 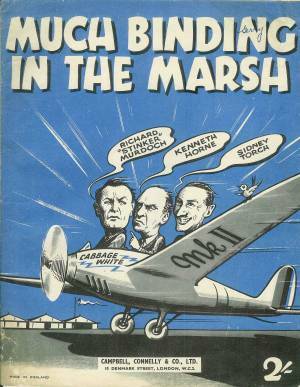 Horne and Murdoch met in the Air Ministry during the war, when Horne was Wing Commander, and Murdoch a Squadron Leader. Sam Costa joined them to represent the rank and file, and Maurice Denham played the upper class Dudley Davenport, Ivy Clingbine and Winston the dog. Following on from ITMA, which was a multitude of catchphrases, both characters had their own - Costa with his batman's, 'Good morning Sir, was there something? ', Denham's 'Oh, I say, I am a fool! ', and Murdoch's 'Have you read any good books recently?' and were always met with applause. The singer Dorothy Carless also took part as Flying Officer Flannel. 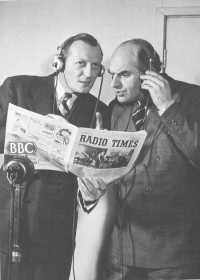 Costa also played Prudence Gush, the radio critic, when Much-Binding became a weekly newspaper, The Weekly Bind, with Dora Bryan as Gladys Plumb, its fashion editor. Much-Binding was said to be King George VI's favourite show after the death of Tommy Handley put an end to ITMA. There followed a successor show to Much-Binding-in-the-Marsh under the title of Over to You. The name was then changed again to simply Much-Binding. we're not supposed to say. At Much Binding in the Marsh, we're giving several Waafs' away as prizes. At Much Binding in the Marsh. He came down six months later to the north of Katman-du from Much Binding in the Marsh. We feel as safe as houses when they're firing. 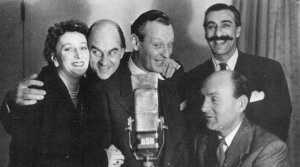 Radio Luxembourg also produced a series of the show which ran in 1950-51. Musical accompaniment was provided by The Skyrockets Dance Orchestra, conducted by Woolf Phillips and then The Squadronaires Dance Orchestra conducted by Ronnie Aldrich. Patricia Hughes also appeared and the show was compered by Bob-Danvers-Walker.